Binance has become one of the world’s most popular crypto exchanges and a big player in the crypto world in general. Its level of reach and energy are evidenced by the sheer amount of adjacent projects it coordinates: Binance Labs, Binance Info, Binance Academy, a charity foundation, an ICO Launchpad, a proprietary Binance token (Binance Coin) — and now, a blockchain of its own, and a decentralized exchange to run atop. Why did Binance go decentralized, and why does it need its own blockchain to do it? How does the DEX work, and how decentralized is it exactly? We review origins, characteristics, usage instructions, and opinions below. This announcement came just a week after the team thwarted an attempted mass scale phishing attack before the hackers could escape with any funds. Last month, Binance CEO, Changpeng Zhao (a.k.a. CZ), confirmed the Binance Chain testnet launch for Feb. 20, 2019. The primary mission of this blockchain is to host and test the Binance decentralized cryptocurrency exchange (DEX). On a Periscope session, CZ commented that Binance Chain represents a departure from Bitcoin, and is much more similar to chains like NEO or Ripple. “A smaller number of nodes, and each node will be rather large”. Validator nodes on Binance Chain are pre-selected by Binance, and they charge fees for their work. We’ll come back to the subject of Binance Chain validator nodes below, in the subsection: Binance and Centralization. Binance Chain was also designed with low latency, high liquidity, and high throughput in mind. According to the official github FAQ, their target is to reach 1 block per second. BNB is currently valued at around $15, and it is in the top 10 by market cap. On the DEX, BNB functions as a base trading pair with the crypto assets listed on the exchange. Binance Chain uses a Byzantine Fault Tolerance (BFT) and (in the near future) proof-of-stake (PoS) consensus mechanism to produce blocks among validator nodes. “This is similar to the architectures of several existing popular blockchain platforms such as EOS and NEO,” reads the FAQ. Read about the implications of this system for the chain’s centralization in the section: Criticism. Familiar user experience: same interface as Binance.com. 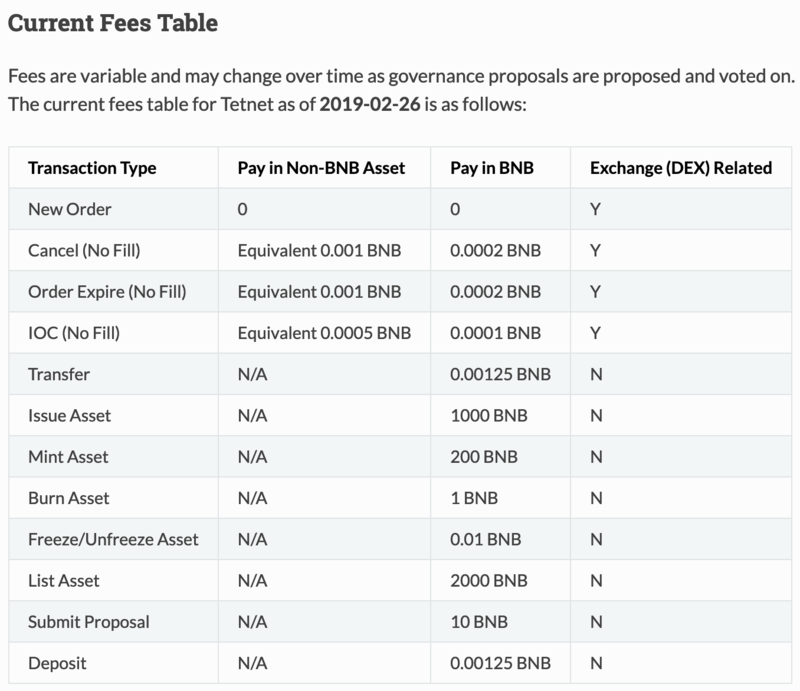 Fees can be paid in any asset, but the network will charge BNB first, and apply a discount if the address has a BNB balance. These are currently the established fees, available on Binance Chain’s GitHub page. Meanwhile, trading fees are calculated based on trade notional value by a block-based matching engine on the DEX. For further trading information, we recommend you consult Binance’s document on the subject here. Trust Wallet was acquired by Binance in July 2018. In early 2019, the CEO and founder, Viktor Radchencko, announced it would also become Binance DEX’s first native crypto wallet. The Trust Wallet app incorporated Binance Chain support in its 2.0 upgrade. In addition to BNB, the wallet supports BTC, ETH, BCH, LTC, over 20,000 Ethereum-based tokens (spanning the ERC-20, ERC-223, and ERC-721 standards), and more. The 2.0 upgrade also includes a desktop version and new cold storage functionality through the integration of hardware wallets. On Mar. 12, Trust Wallet announced support for Ripple (XRP) and credit card payments. The Trust Wallet interface is built into the same environment as the Binance Exchange interface. A question that will no doubt arise for many is, why would a centralized exchange run a parallel decentralized exchange? In a recent article posted on the Binance blog, CZ makes the reasoning behind Binance’s endeavors more clear. Although CZ calls himself “a big proponent of decentralization,” he also claims most people’s funds are safer in centralized custodial services, since people often lose their keys. “Centralized exchanges [also have] far higher trading volumes and liquidity on them than decentralized ones.” So, why create a DEX? Well, the CEO claims there are pros and cons to both, in terms of ease-of-use, freedom, and security. Ultimately, he justifies the decision to hold both a CEX and a DEX as freedom of choice for users. Thus, Trust Wallet exists so that users can choose to control their own private keys, and Binance Chain and the DEX are there so users can choose to use a decentralized exchange. Some of Binance’s most outspoken critics have attacked Binance and CZ explicitly on the subject of centralization. Binance Chain uses the Cosmos SDK on top of a forked edition of the Tendermint consensus (a Bizantine fault-tolerance, proof-of-stake consensus). When CZ talks about the team having some influence over the chain, he is referring to the 11 predetermined, Binance-influenced validator nodes, or block producers, that confirm transactions according to this architecture. Considering that trading fees are paid to validators, and that so many functions incur in fees, including a 0.1% trading fee — or 0.04% if paid in BNB, 48% of the supply of which is owned by Binance anyway — not everyone in the crypto community feels like Binance DEX’s monetization scheme acts within the spirit of a DEX. Since Binance Chain works with a proof-of-stake consensus mechanism, it is not unimportant that 67% of the BNB supply is owned by just 5 addresses (the first being Binance): these 5 addresses will control 67% of the voting power. Chico Crypto, a YouTuber known for his inflammatory videos against Binance, has calculated that a new crypto project that wants to list on Binance DEX will have to pay 12,200 BNB (this includes the cost of issuing an asset, minting an asset, and listing assets, as indicated in the table provided in this article). Binance is extremely popular in the crypto community, and its contribution cannot be denied. At the same time, it must also not be overlooked that their new DEX is most definitely pushing the definition of a “decentralized exchange”. It remains to be seen whether the criticism will overtake the loyalty; we might have to wait until the mainnet for that answer.